The exercises focused on “air sovereignty, air interdiction, air-to-ground integration, air mobility operations, aeromedical evacuation, cyber defence, and personnel recovery,” US Air Forces in Europe said in a statement. 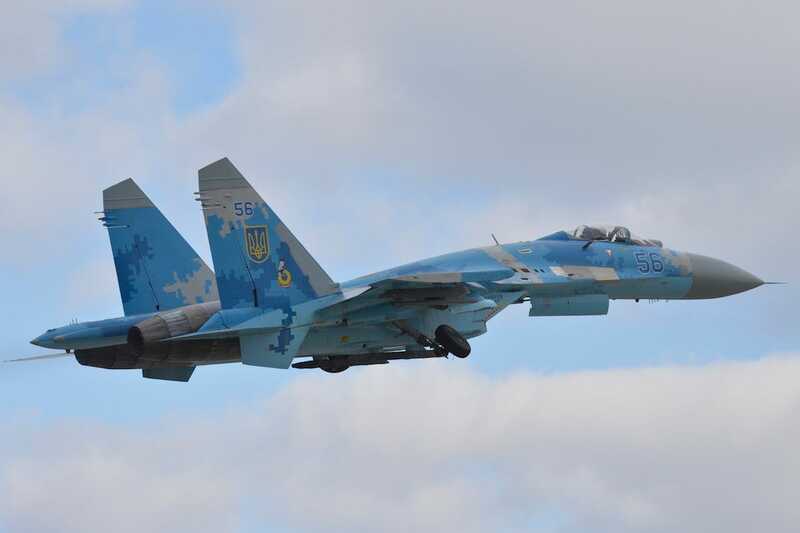 Here’s what the Su-27 can do, and what we know about the tragic crash. The Russian Sukhoi-27, which NATO codenamed “Flanker,” first flew in 1977, and later entered Soviet service in 1984. 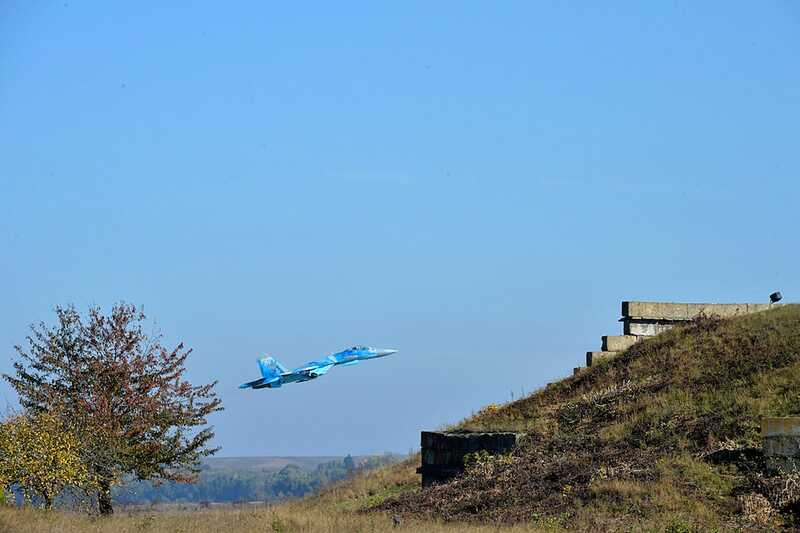 US Air National GuardA Su-27 takes off from Starokostiantyniv Air Base in Ukraine during Clear Sky 2018 on Oct. 9. 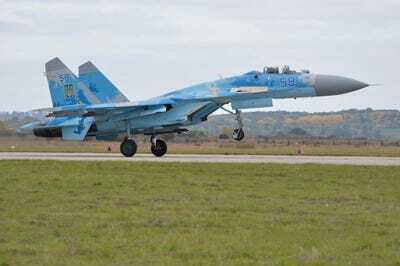 Designed as an interceptor and air superiority fighter, the highly manoeuvrable Su-27 has a top speed of about 1,800 mph and a maximum ceiling of about 59,000 feet. US Air National GuardA Su-27 Flanker ascends from Starokostiantyniv Air Base in Ukraine on Oct. 10. 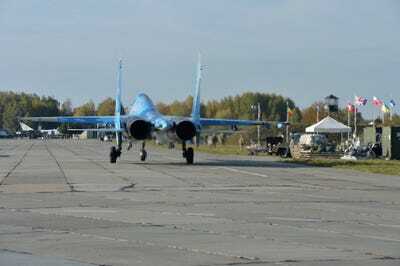 US Air National GuardA Sukhoi Su-27 retracts its wheels while ascending from Starokostiantyniv Air Base in Ukraine on Oct. 9. The F-15, however, can only be armed with eight air-to-air missiles, including four AIM-9 Sidewinders and four AIM-120 Advanced Medium-Range Air-to-Air Missiles or eight AIM-120 AMRAAMs. It’s also armed with an M-61A1 20mm, six-barrel cannon. US Air National GuardA Sukhoi Su-27 flies away off from Starokostiantyniv Air Base in Ukraine on Oct. 9. The Su-27UB, which first flew in 1985, can be fitted with the same munitions and weapon control systems as the Su-27. But it has a few slight modifications, namely that it’s a two-seater instead of a one-seater. 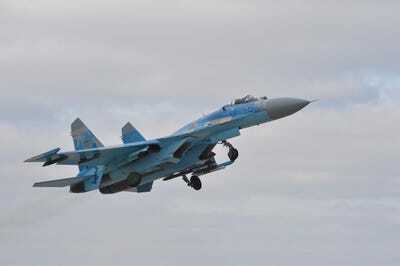 Although details about Tuesday’s crash are still scant, the fact that the Su-27UB is a two-seater likely explains why both an American pilot and Ukrainian pilot were killed, given that the exercises were meant to bolster interoperability. 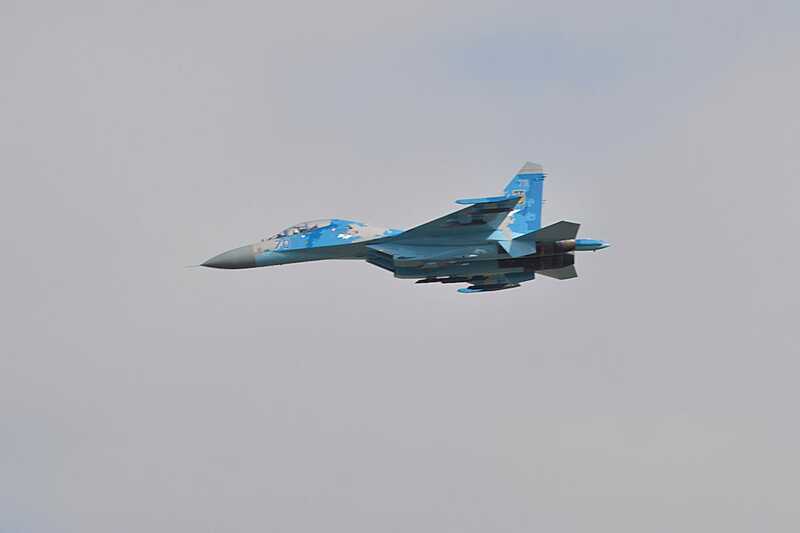 US Air National GuardA Sukhoi Su-27 flies during opening ceremony of exercise Clear Sky 2018 at Starokostiantyniv Air Base in Ukraine on Oct. 8. “This is a sad day for the United States and Ukraine,” Maj. Gen. Clay Garrison, Commander of the California Air National Guard and the director of the Clear Sky exercises, said in a statement. 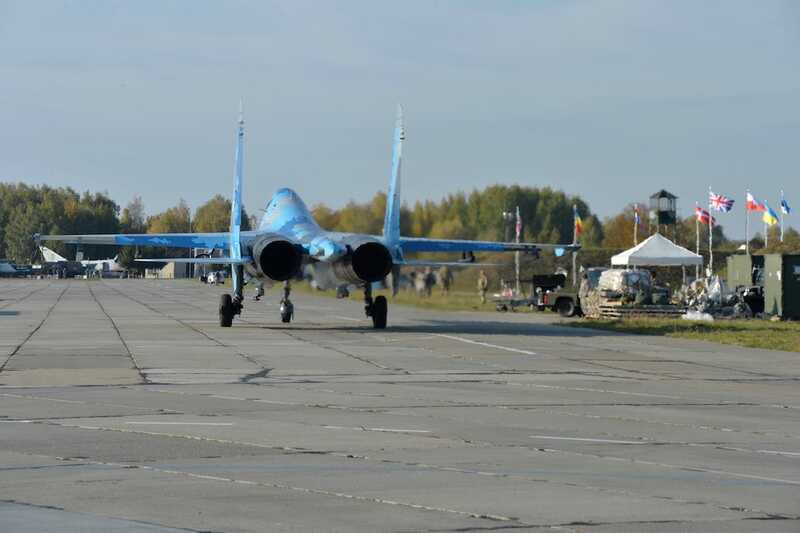 US Air National GuardA Sukhoi Su-27 Flanker taxis down the flight line during the first day of flying for exercise Clear Sky 2018 at Starokostiantyniv Air Base in Ukraine on Oct. 9. “Our deepest condolences go out to the family, friends and fellow Airmen of both the U.S. Airman and Ukrainian aviator who were killed in the incident,” Garrison said. The crash is still under investigation, and the US pilot’s name is being temporarily withheld pending notification of next of kin.